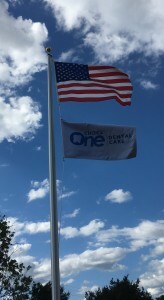 On Friday, May 19th, Choice One Dental Care of Columbus celebrated its one year anniversary with a Flag Pole Dedication and Flag Raising Ceremony. Our managing dentist, Dr. Terry Wilkey, welcomed guests as they arrived for the event. COL Robert S. Poydasheff (US Army, Retired and Former Columbus Mayor) led the crowd in the recitation of the Pledge of Allegiance after the raising of our Country’s flag and the Choice One flag. 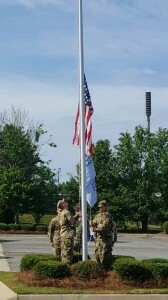 The flags were raised by Soldiers from Fort Benning’s 198th Infantry Brigade, which consisted of the NCOIC, SFC Kristopher Jackson, SGT Oberdorfer, SPC Williams, SPC Macky, and SGT Trueblood. Our guest speaker for the celebration was MG Jerry A. White (US Army, Retired and Former Commanding General of Fort Benning). Following the ceremony, staff and guests enjoyed cake and punch. To continue our patriotic celebration, we would like to invite everyone to drop by on Flag Day (Wednesday, June 14th) between the hours of 8:30 a.m. to 3:30 p.m. to see our beautiful flag pole and flags. There will be punch and cookies as well. Everyone who drops in will receive an American flag lapel pin and a small flag. We look forward to seeing you! Thank you, Gen. White. We were honored to have you with us that day and your remarks about Soldiers and our Country were very moving. Thank you for being a great American Soldier, a dear friend, and a patient of Choice One Dental Care of Columbus.